It’s been just almost 6 months since my last blog-everyday-challenge. The first was National Blog Writing Month (NaBloPoMo) and the following month I participated in reverb10. To be honest, NaBloPoMo really changed my life. I learned a lot about myself as a person and finally came out as a writer – a person I have been since I was 6-years old but never self-identified as (I’ll save that for another post). But real life has stepped in and I’ve been writing in other places, like here and here. So when the team at The Domino Project told me about a challenge their launching today and asked me to write a prompt, how could I resist? #Trust30 is an online initiative and 30-day writing challenge that encourages you to look within and trust yourself. 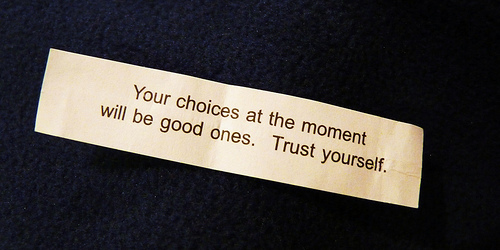 Use this as an opportunity to reflect on your now, and to create direction for your future. 30 prompts from inspiring thought-leaders will guide you on your writing journey. Sign up below to receive the prompts by email. If you like this pledge, check out reverb10, it’s inspiring. The #Trust30 challenge starts at 6am ET on May 31st and runs for 30 days. Each day we’ll post a prompt from an original thinker and doer on RalphWaldoEmerson.me. You can also sign-up for daily emails. Fill out the short form below to commit to participating in the #trust30 online initiative. Blog, journal, or create something on each of the 30 days. Tweet using the hashtag #trust30 to show your support and involvement. It’s one hell of a great way to market a book. I am humbled to have contributed a prompt along with authors I admire like Jonathan Fields, Jenny Blake, Ashley Ambirge, Matt Cheuvront, Gwen Bell, and Sam Davidson. To keep track of these brilliant minds and others who sign up to the challenge, I’ve created this list on Twitter: Trust30 (feel free to subscribe). Plus I’m not as familiar with Ralph Waldo Emerson’s work as I am with Henry David Thoreau, and this is one great way to make his work “come alive” and experience it. Plus, good ol’ Ralph is all about trusting yourself – something I’m very much a fan of. I have committed to the pledge, though after looking at my calendar for the upcoming month and knowing how much time I invested during NaBloPoMo, I know it’s going to be hard to stay on track. But I’m going to try and I’d like you to help me. Will you take the pledge and join me in the #Trust30 challenge? What worked during NaBloPoMo and reverb10 was that I was not the only person doing this. If you come on board, please leave a link to your blog in the comments – I want to follow you too! This entry was posted on Tuesday, May 31st, 2011 at 6:00 am and is filed under on writing. You can follow any responses to this entry through the RSS 2.0 feed. You can leave a response, or trackback from your own site.